"Camping Albatros" was created from the passion for itinerant tourism and for the great outdoors. We established it thinking of the many tourists who like to travel with RVs, MOTORHOMES or MOBILE HOMES and who need a quiet rest area, spacious and with comfortable services. The campsite has fully equipped sites for CAMPERS, MOTORHOMES AND MOBILE HOMES. We also have dedicated areas for tents and, upon request, we have a few Mobile homes with porches. 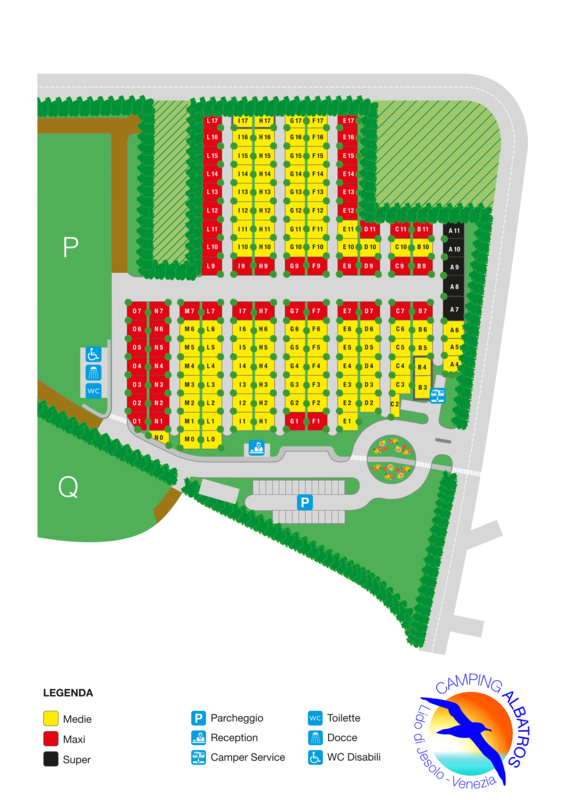 The campsites are divided into 3 types: Medium site (7 x 8 mt), Maxi site (8 x 8 mt or 7 x 9.5 mt), sites (7 x 14 mt). Each site has a service bollard so you can hook up to drinkable water and electricity. Nearby each site there is also a catch basin with drain pipe for sewage. Each site has an exclusive hook up. The minimum electricity is 3 amperes (about 700Watt). With an extra charge you can consume up to 6 amperes. Moving about easily is guaranteed by wide gravel roads that allow for comfortable driving, even the most cumbersome vehicles without limitation of weight and length. All internal roads have manholes for the drainage of rainwater. We have 2 CAMPER SERVICE, with 2 septic tanks, one of which is positioned in the middle of the campsite in a compartment reserved for the services unit. Even passing campers can use the outdoor CAMPER SERVICE paying each individual service. For those staying in the Campsite the CAMPER SERVICE is free. The sanitary facilities consist of the services unit where there are 12 coin operated hot showers (€ 0.50), including one inside the bathroom for the disabled. Outside there are other 4 free showers with cold water, only used for rinsing without soap. There are 10 bathrooms. In the east side of the services unit there are five sinks for washing dishes and 4 sinks for laundry. We have WIFI and it's free. Prices refer to 24 hour stopovers of an RV, motorhome and mobile home including crew up to 4 people. Also included in the price: 3 ampere electricity, drinking water, waste and sewage water dumping, use of CAMPER SERVICE and wifi. In the Medium campsites RVs, Motorhomes and Mobile Homes with shaft may not exceed 7.80 mt in length; in the Maxi sites (7 x 9.5 mt) 9.00 mt in length. For tents the same rate as the MEDIUM sites are applied respecting the aforementioned terms. There is a special area for them. Pets (dogs etc.) are welcome and stay for free. Prices do not include the accommodation tax. The entrance is about 350 metres away from the sea. To the east we border with the pine forest, to the west with the busiest tourist area starting from Piazza Torino, which is about 800 metres away.